Don’t count on catching many fish in cold weather. I think most of us take towels for granted. At least I do. I wash, dry, fold, and replace them at least weekly in my bathroom. I automatically reach for my bath towel when I get out of the shower, and I am never disappointed. Our RUV (recreational utility vehicle) that we have dubbed Thor has small holding tanks, so when we camp at state parks (which usually do not have sewer hookups), we use the wash house facilities. That means we have to take our shower “tools” with us—soap, wash cloth, shampoo, and a towel. A couple camping trips ago, Jim left Thor without his towel. I laughed. It was funny to watch him return dripping. On our last camping trip, however, I walked to the wash house without my towel. What made my drip-drying even worse was that I had taken a wrong turn out of the wash house and started to walk in the wrong direction—in the dark of night. (After about 50 yards, I realized my mistake and turned around.) When I got back to Thor, Jim laughed. I didn’t think it was so funny. Last night, I gathered my soap, shampoo, and wash cloth. As soon as I got to the wash house, I realized I had (again) forgotten my towel. It was very chilly outside, with temperatures hovering around 50 (or lower) by the time I had gone to shower. Should I return and get my towel? Or should I drip dry? I decided to drip dry. It actually was not too uncomfortable walking back to the RV wet. Our only catch (aside from a crab that grabbed my bait and became bait itself) was this 13" flounder. It's a good thing fishing is more about just getting away and having a good time rather than bringing home supper. Not so much. Wednesday I caught a crab on my fishing line; the crab was trying to get a free dinner and latched onto the bait. We used it for bait. Yesterday it was so cold we didn’t even go out. Today, it was warmer (around 60) and sunny, so we ventured out. 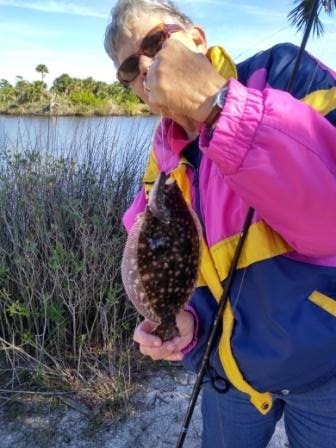 After an hour or so, I finally caught a flounder—my first ever. Although I had a few other bites, I had no catches. Neither did Jim. Jim assures me that fish are there, even in cold weather. We just can’t find them, fishing from shore. So, fishing in cold weather is a test of patience—and endurance of the chilly temperatures. Tomorrow we head home. Despite the lack of catchin’ we had a good time. The thermometer reads 55 degrees. With a brisk wind blowing at about 10 mph, it is too chilly to fish. (We tried that the last two days, with cold hands and zero results.) So, instead of fishing, today we continued our exploration of the Ormond Beach-Daytona Beach areas. 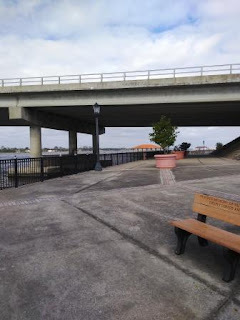 A scenic drive that followed the Halifax River took us from Ormond Beach to Daytona. After leaving a residential area of charming old houses, we found ourselves on a stretch of city street in Daytona. A sign said “dog park.” But beyond the obvious frontage of the park we could see an island linked to the mainland by a footbridge. Curious to see if it was possible to fish from the island, we parked and made our way over the footbridge. The island was called Manatee Island. On it, there was, indeed, a fenced-in dog park with areas for small dogs, big dogs, and bad dogs. (Only only little pooch was running around in the little dog area, with its owners. He didn’t care for us too much.) Apparently this little island, which also had a children’s recreational area, was home to manatees, although we didn’t see any today. 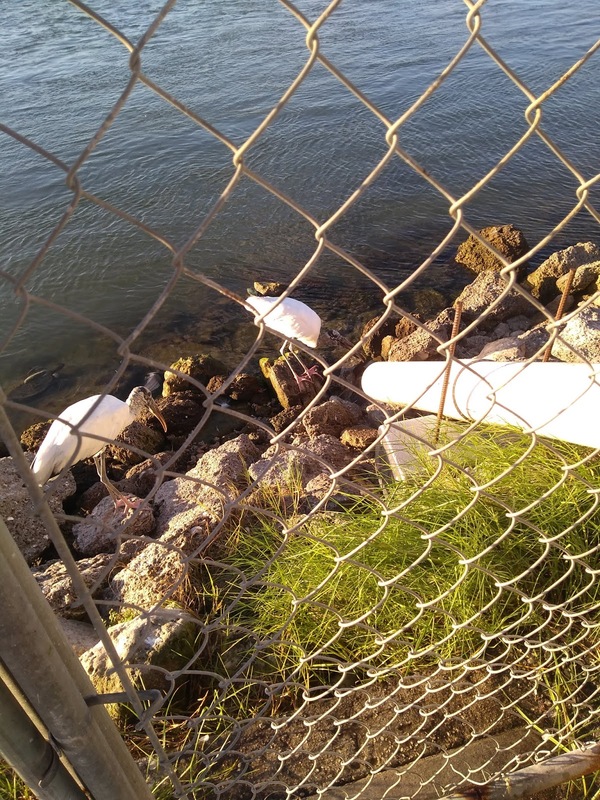 There was also a broken-down fishing pier. No one could use the pier, but seagulls made it their home. Neither of us had ever seen so many earth-bound seagulls at one time. 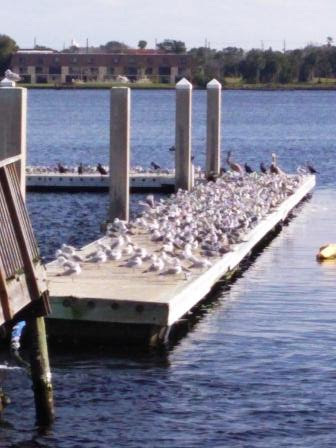 Seagulls warmed themselves on the abandoned fishing pier on Manatee Island, a small islet in the Halifax River in Daytona Beach. The island, most likely built from river-dredging material, is home to a dark park as well a kids' recreational area. A footbridge links it to the mainland. After leaving the dog park, we kept traveling south to the old city center of Daytona Beach. We found a large library, a baseball field (minor league play), and a variety of shops. We were in search of one in particular—Angell & Phelps Chocolate Factory. A chocolate worker prepares a raspberry filling, which will be cooled then cut into squares, and finally coated with chocolate. (Who knew that filled chocolates were made in that manner?) Before the guide told us this was raspberry filling, I thought it was taffy. All of the chocolates in this small factory are handmade and hand-boxed. Need I say that we did not leave the chocolate factory empty-handed? Before the tour, we had sampled its fudge. We left with a half-pound each of chocolate fudge, chocolate-peanut butter fudge, and (because it was “buy two, get one free) orange-vanilla fudge, as well as a package of chocolate-covered bacon. After the chocolate factory, we continued our tour of the area, just to see what this part of Florida is like. Would it be somewhere we might want to live? (Whenever we visit a new area, we take a “gut-feel reading” of the area.) Ormond Beach, mostly yes. It is actually quite nice, especially away from the beachside area with the usual surf shops. Daytona Beach? Mostly no. Near the beach, you would think you had stepped into the last century, specifically in the 1950s. I wasn’t too impressed with other Volusia County beach communities, either, including Port Orange, Daytona Shores, and Ponce Inlet. Tomorrow it is supposed to warm up a bit, almost to 70. I hope the wind dies down and the fish get hungry. “Oh, the weather outside is frightful…” It is weeks after Christmas, but the line from that carol echoes in my head, because it is cold outside. Today it is in the 50s, quite a change from when we arrived at Tomoka State Park in Ormond Beach, Fla.,yesterday, amid temperatures in the sunny 70s. 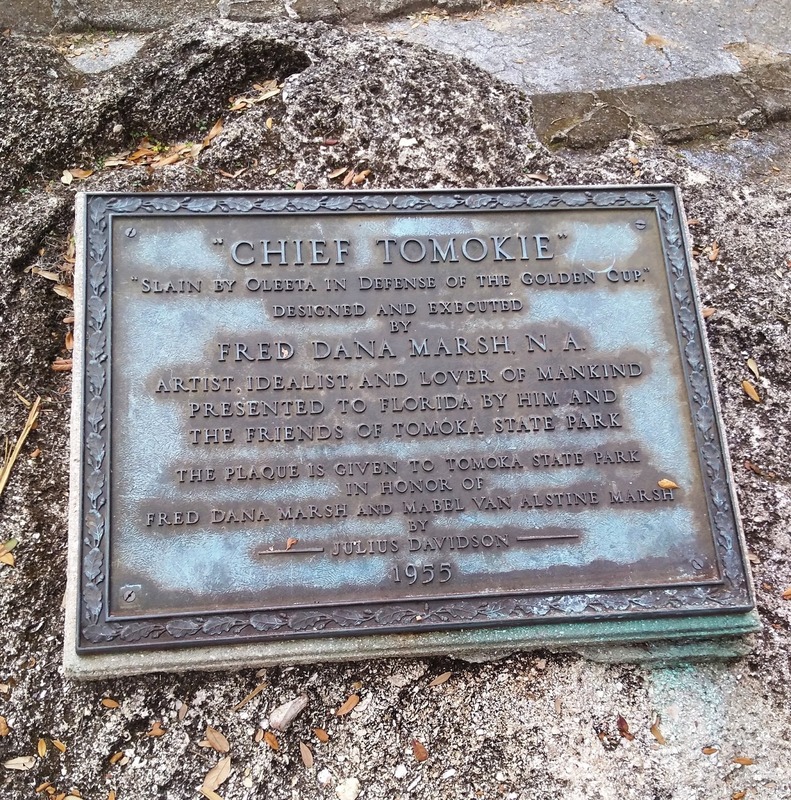 The monument to Chief Tomokie is erected in the Tomoka State Park. 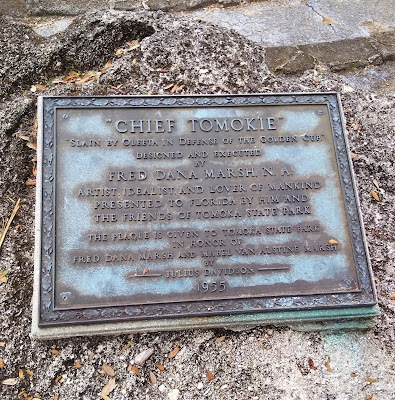 The chief is a mythological legend of the Timucuan Indians. The myth said he drank from waters that gave everlasting life.. The intent of our initial drive around the area was to find places to fish. We are constantly amazed at how well these smaller communities we have visited have developed riverside (and oceanside) parks, complete with fishing piers. For example, Ormond Beach has developed beautiful parks with fishing piers and sheltered pagodas on both ends of the bridge that spans the Halifax River. Daytona Beach has a fishing pier on the ocean. Neither community charges a fee to use these facilities. 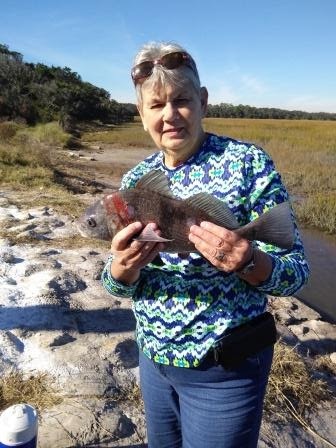 Jacksonville is virtually surrounded by water—several rivers and the Atlantic Ocean—yet there are few good places to fish. As an example, the Atlantic Blvd. and Beach Blvd. bridges that span the San Pablo River would be perfect places to fish—except that to access the water you have to climb over some serious rocks (if you dare; I don’t). 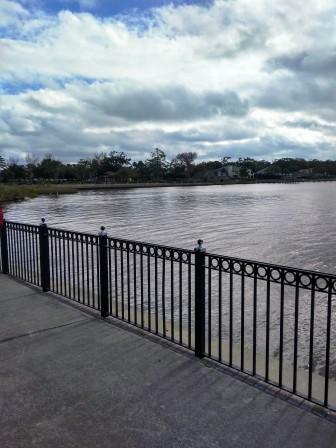 Oh…and the fishing pier in Jacksonville Beach? Users have to pay a daily fee to fish, or even to stroll down it! 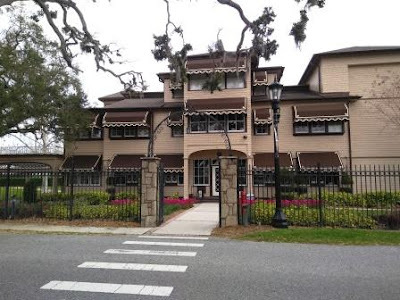 As Jim and I were driving around and exploring possible areas to fish, we discovered a hidden gem in Ormond Beach: The Casements, the winter home of John D. Rockefeller. This house has been restored by a historical society and is open to the public. It is used for meetings, weddings, and fund-raising. It is also open as a free museum with either a self-directed or guided tour. We learned quite a bit about this beautiful old house, as well as Rockefeller, whose source of wealth may be dubious but whose distribution of that wealth has done much good through various foundations. The Casements, John D. Rockefeller's winter home in Ormond Beach, Fla.
After lunch at an excellent Greek restaurant, we braved the elements to fish—for about 30 minutes. The north wind was just too much, especially as the temperature dipped into the mid 50s. We finally called it quits for the day and went home to Thor to thaw out. We picked up a lot of literature about Volusia County, in which Ormond Beach resides. If the weather (or at least the wind) remains too cold for comfortable fishing, we’ll do some more exploring tomorrow. The middle of December always meant two things to me: a time to celebrate the birthdays of my two youngest sisters, Dawn and Sally, and time to put up the Christmas tree. This year, I called each of my sisters on her birthday (Dawn, December 12; Sally, December 13—two years and one day apart). We won’t be putting up a Christmas tree (we stopped doing that a number of years ago), but mid-December has meant it is time for a December RV trip. We are at Little Talbot Island State Park, just 30 miles north of our house. Why bother to camp just 30 miles from home? Because when we take the time to make a camping reservation, pay our fee, and actually drive to the site, we commit to taking time off from daily chores and enjoy ourselves. And that is exactly what we have been doing since Tuesday. An older park, Little Talbot Island State Park has a number of camping spots, but only two that can accommodate RVs up to 30 feet. We could never have camped here with our other RVs, since the first was 38 feet, the second 40. 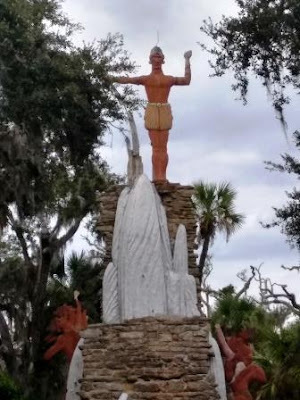 Thor is only 27 feet, a definite advantage for visiting many of the state parks. The wash houses are old but clean (as have been all of them). The campsite is relatively secluded, with many trees around. 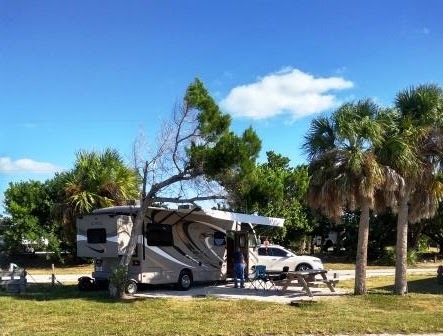 In general, Florida has great state parks, and we enjoy the rates for us old folks—half price. So camping is very reasonable. Little Talbot Island SP is surrounded by water—marshes, creeks, and (of course) the ocean. The first place we fished on December 12 (upon the recommendation of the park ranger) was at a bridge about a mile from the park. We hiked down to a spot on one side of the creek; another couple was on the other side, perhaps a hundred yards (or less) away. 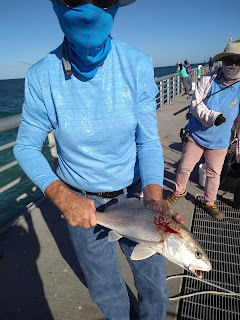 I swear…that couple (who was using shrimp as bait, just like us) pulled in a dozen or more fish (mostly speckled sea trout) in the couple of hours we were there. Our luck? Well, the score yesterday was Linda, 1; Jim, 0. I caught a nice 16” black drum. It was a delicious dinner. Today (December 13) we went across the road to the marsh, as the tide came in. 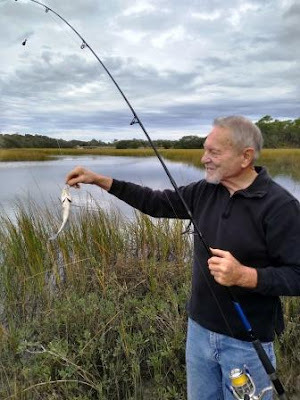 Jim caught two little black drum; I caught one. After a couple hours in the marsh, we headed back to the bridge where I caught the dinner fish yesterday. This time we fished from the site where the couple was catching all of that trout yesterday. Today? Jim, 2; Linda, 0. Take-home fish? 0. A young man who joined us caught a few juvenile black drum, but he didn’t get any keepers either. I think the weather had an effect on fishing: Although the temperature claimed to be in the lower 60s, it felt very cold, and I suspect the water temperature reflected the drop in temperature. Jim caught four juvenile black drums today. 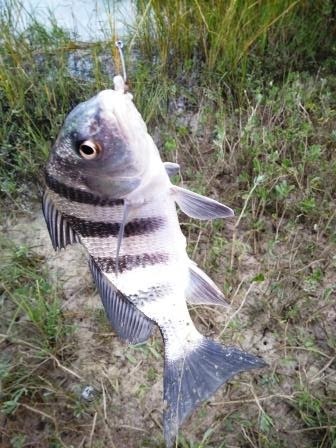 The photo looks like this is a big fish, but unfortunately, it was not big enough. It is one of the juvie black drums we caught. Tomorrow we are heading back home. The journey will take (at the most) 40 minutes. We night do a little fishing if the weather holds. Right now, thought, it is raining, so I think our fishing expedition for December is probably done. We got locked in again—just like the other day. Jim again had to exit through the escape window in the bedroom. The first time this happened (a couple days ago), he had discovered that the door would not open because a screw had worked its way out of the latch on the door jamb. He tightened the screw, but when I discovered it coming loose again the next day, he removed it. Last night, as he was going to the shower house, he couldn’t open the door. The latch, held in by only one screw, had become dislodged enough so that the door would not open. So, Jim had to put on his clothes, climb out of the window, and pry the door open. Jim says the fix is easy: apply Locktite to the screw. I hope we don’t have any more problems between the time we leave and when we get home. We have to go in and out several more times. Wish us luck. Another “trick”—the no-see-ums. I am one big bite--actually, I have hundreds of tiny bites, from head to toe. Literally. And I am miserable. For those of you who do not live in Florida, no-see-ums are tiny, tiny biting insects, females that seek a protein in vertebrate flesh to use in their reproductive cycle. If you were to spot them on you, you would think they are a fleck of dirt. In the proper light, you may see them flying about, looking like dust.It is virtually impossible to kill them. Slapping at them does no good. By the time you feel the bite, they are gone. Incidentally, these pesky insects are not always deterred by bug spray. And even worse: They can come through normal screening. We have no-see-ums in Jacksonville, but they are not as bad as they are here. Also, they do not bother us on our screened in porch because the screening is fine enough to keep them out. In addition to our own catch, we were given treats by fellow fishermen. A neighboring fisherman caught a huge jack but didn’t want it. (Jack is considered a trash fish, and many people don’t keep them, but we have found that if properly prepared, jack is delicious. In fact, most "trash" fish can be prepared to taste good.) That big fellow went into our cooler. The second treat came later in the afternoon, when a school of mullet swam directly in front of the fishing jetty. It was a huge school—hundreds of fish. 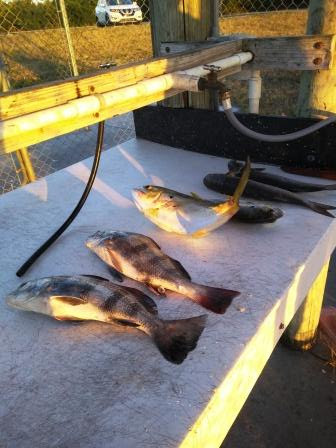 Jim's catch and extra treats: two black drum, a huge jack crevalle, a smaller jack, and two mullet. The most common way to catch mullet is by casting a net; they don’t usually take bait on a hook. We didn’t have our net with us, so we were out of luck. (It was exciting to see the school, however.) But a fellow who had a really big net (perhaps 10 feet in diameter) cast. It took three big, muscular men to haul that catch of mullet up. It weighed a couple hundred pounds, at least. The catch overfilled a large ice chest. I asked the owner if I could have a couple of the fish, and he graciously gave me a couple, which joined our other catch in our cooler. We will brine the mullet tonight and tomorrow smoke it. Can’t wait to taste them. The treats were better than the tricks. We always have a good time on our getaways. This little vacation was different: We had a superb time (despite the faulty door latch and the no-see-ums)! 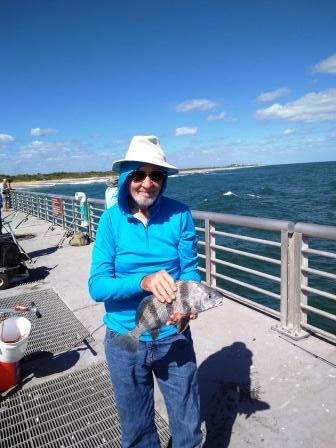 Sebastian Inlet, about three hours south of Jacksonville, is a fisher-persons's paradise. The area used to have a thriving commercial fishing industry. A change in fishing laws (to protect from over-fishing) as well as a hurricane put an end to commercial fishing. However, the inlet is a haven for sports fishing. 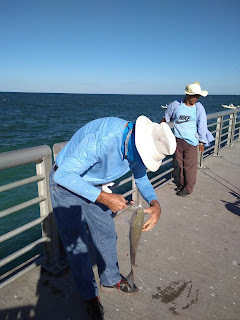 I reported that on Sunday we went down to the jetty and watched people haul in HUGE fish. One young man pulled in a snook that had to be three-feet long. (If it was that long, he had to throw it back. Snook is a slot-fish. Only those between 28" and 32" can be kept.) "Ah," we thought, "we will finally catch some fish!" So...the next day we went down to the jetty and fished. And fished. And fished. We didn't even get a nibble. We weren't the only ones; no one was catching fish on Monday. Maybe the fish knew we were there; perhaps we were jinxes. Yesterday was a different story. In the morning, we fished off a fishing pier on the lagoon in the state park. I almost immediately caught a fish...unfortunately it was a little pin fish, about 5 inches long. Pin fish are bait fish. I decided to cut it up and use it as bait. That brownish blur is a manatee that decided our fishing spot was a good place for brunch. In a little while, I had my second catch: a good-sized hardhead catfish. It was big enough to offer some nice filets, but we decided to toss it back. Saltwater catfish are considered trash fish. We subscribe to the theory that all fish are edible. Some are more tasty than others, however. The hardhead is not bad to eat; it's just not delicious. I had been fishing with bait; Jim had been using artificial lures. He finally switched to bait after the pin fish nibbled away at two or three of his soft lures. His only catch? 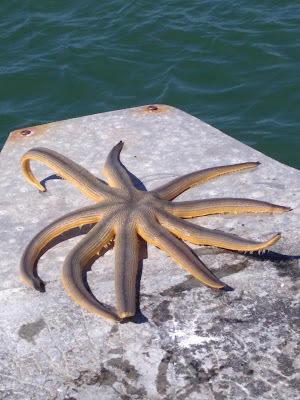 A starfish. Obviously not edible, but interesting! 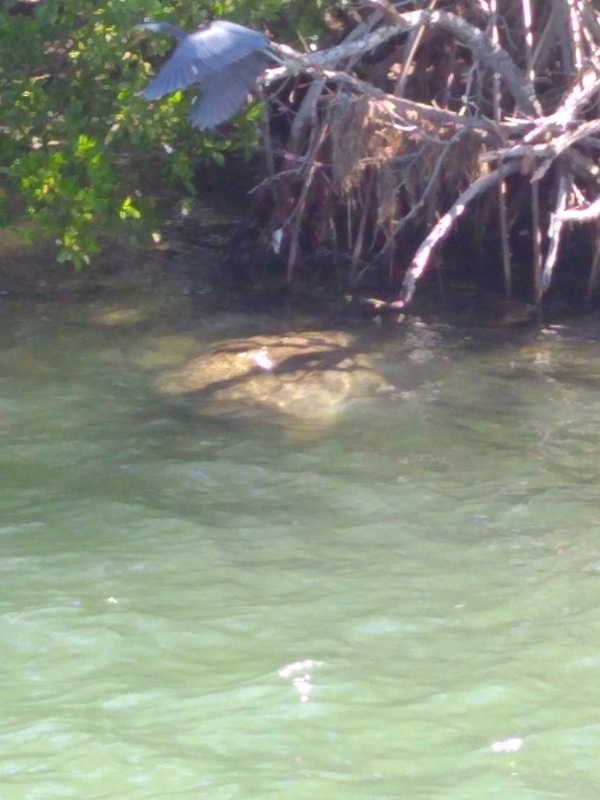 The morning was highlighted by a manatee that decided to brunch on the underwater greens near us. During the afternoon's outgoing tide, we went back to the jetty. We took a position on the ocean-side of the jetty, about 10 feet away from an Asian couple. That man and woman snagged fish after after! Within 20 minutes, I swear that had caught 20 fish. Many were jack crevalles, a fish that many (again) consider trash. This fish has no size or quantity limits. I caught two, one which was too small to keep. Jim caught a small one. We left the jetty around 5 p.m. and stopped within the park to clean our catch. The cleaning table had running water. Waste water (and any scraps) rinsed down a pipe into the lagoon. Three big birds (a species of egret, I believe) waited at the end of the pipe. They actually fought after a piece of waste! But all of them went away well fed. One last day of fishing. I hope it is profitable for our dinner table tonight. Dinner last night was delicious. As I have written so many times before, even retirees need a vacation, and for the next several days, that is what we are doing--vacationing. 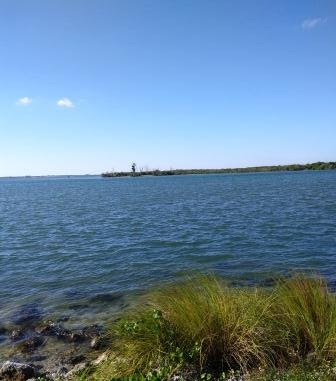 We arrived at Sebastian Inlet State Park (about 3 hours south of Jacksonville) yesterday afternoon. This is a beautiful area, with many places to fish, including just off out campsite. We went down to one of the piers yesterday afternoon. People were pulling in huge (36-inch) fish (snook), as well as smaller species. Today we will try our angling skills. Our campsite has an unobstructed view of the inlet, with the ability to fish by walking across the road. The park has many other places to fish, however. The state Department of Natural Resources still has the park listed as having red tide, but there is no evidence of it. Birds are fishing; people are fishing. Some people are also going into the water. This morning it was only in the upper 50s, and water temperature is only in the 70s, so I won't be getting wet any time soon--at least intentionally. The fishing is promising, but the big news is that we were locked in last night! Jim was going to go outside and check on the awning before coming to bed. He could not get the door open! Obviously, 11 p.m. is not the time to try to fix a problem such as a stuck door, so we "slept on it." The problem, of course, didn't go away during the night. He wondered if there was a problem with the chassis...somehow buckling? Sounded far-fetched, but who knows? Anyway, Jim couldn't get the door open from the inside, so he climbed out through the emergency escape window in the bedroom. Fortunately, ours is not a tall RV, so the drop to the ground was not bad. Now we know how to escape. The problem with the door turned out to be a screw that had semi-dislodged and jammed the door so that it couldn't open. He managed to pry it open, reset the screw, and we are back in business. Problem solved.